Fresh on the heels of 2017’s “Solennial”, UK Doom ensemble ALUNAH vocalist and guitarist Sophie Day made the decision to explore other passions and left the band. This left husband David Day and bandmates Daniel Burchmore and Jake Mason a daunting task. Somehow they needed to find a vocalist worthy of filling now present void of haunting vocals and stunning lyrical imagery vacated by Day. Enter Sian Greenaway, who joins the band from the vastly more up-tempo BEAR LEGS, who she handled guitar and vocals for. Based on this quickly released EP, “AMBER & GOLD” I’m inclined to believe the band has managed to accomplish their task. Quite well at that. ALUNAH at it’s core comes at you like a wizened old Druid from from atop some mountain in a fantasy novel. Lyrics centered around nature themes and paired with the heavy rhythms of Doom is quite effective. Having these songs presented by a female vocalist, adds an alluring factor that can’t be ignored easily. Their songs are primal, magical and sensual. Those attributes drew me in and won’t let me go. The EP “Amber & Gold” opens with the slow, building rhythmic drums of “Mangata”. Burchmore’s distorted bass lines and Day’s guitar solos weave in and out while Greenaway’s equally distorted haunting vocals make their debut appearance, only to make you wonder if they were ever truly there. Clocking in at just under 2 ½ minutes, this left me wanting this jammed out more. Thankfully the title track of the EP continues where “Mangata” left off. The song “Amber & Gold” is absolute fuzz goodness, and gives Greenaway a far more proper introduction. Any concerns about ALUNAH losing a step due to a new vocalist are immediately forgotten. Greenaway slips into place easily and convincingly and should have no issue presenting the bands older material. Her vocals share the intenseness and beauty of Day’s, yet adds more richness, warmth and range. It’s different, yet familiar and comfortable. “AWN” follows and just reinforces how impactful ALUNAH’s lyrical content can be. A sonic mystical story is being presented here, and the band utilizes every musical spell they’ve got. The lyrics and bewitching presentation from Greenaway could all be for naught. Yet the equally compelling music being conjured up by Day, Burchmore and Mason complement and yet add keys elements that rival the importance of the lyrics. Always a band that can re-interpret and re-invent another band’s song, ALUNAH does so again in a perhaps surprising cover of Chris Isaak’s “Wicked Game”. The band does a bang-up job of making the song all their own by slowing down the tempo to a Doom’s pace all while Greenaway replicates the seductive longing of the original version. I didn’t think it would, but it absolutely works. 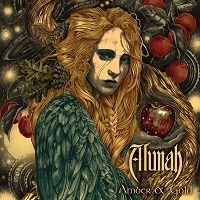 What ALUNAH and Sian Greenaway have done with “Amber & Gold” should ease any worry by the departure of Sophie Day. Sophie will be missed, and I for one hope to hear her sing again somewhere in the future should she wish too. But ALUNAH is going to be just fine. The magic is still swirling within, and “Amber & Gold” is just a wee taste of what new spells they’re concocting.